A QUIET revolution has been going on at Brixton Prison. No need to worry. The inmates have not taken over the institution; but instead some under-the-radar trialling of a new rehabilitation programme has been producing remarkable results. So much so that prison authorities are now starting to share it with the rest of the prison system – and they would quite like politicians and the public to know too. 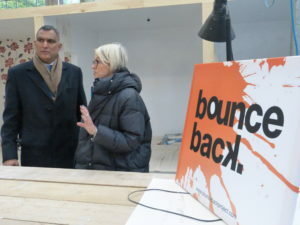 That is why I took up their invitation to go along there recently to take a look at the initiative they call Bounce Back. It involves training suitable inmates in construction skills – a sector with a particular labour shortfall. They also learn scaffolding, which is generally a highpaid offshoot of the building and demolition sectors. It is known as a tough and rough working environment populated by a rough and tough workforce. Ex-convicts, or “offenders” as the criminal-justice system likes to call them, seem to be largely undaunted and ready to fill the vacancies. So Bounce Back differs from previous rehabilitation programmes by focusing not just on employability but on specific skills and experience which are hotly in demand. The average national reoffending rate for criminals is 40 per cent, say the Brixton team. For Bounceback trainees it is just 15 per cent. Its priorities are not on paperwork, although certificates in construction work are a goal. The main aim is to have people who can walk out of prison on day one and be ready to work on site on day two. As participants told me, it gives them a sense of hope, a sense of value and a skill to apply when they come out. Instead of this, many prisoners will leave prison with a £45 subsistence payment in their pocket and no idea what to do next. Frequently this leads quickly to re-offending and homelessness. The training rooms which the inmates work in at Brixton are pretty good: clean, bright and well-organised. Each prisoner gets a booth to work on and builds it from scratch: laying, painting, filling in holes, and so on. They have a to-do list to work through and lessons at each step. I spoke to one trainee who was inside for inflicting Actual Bodily Harm. His fifth child is on the way in a couple of months and he seemed quite determined to get it right upon release this time. The prospect of walking into a job as he left was clearly nurturing him in that ambition. One of the trainers confided in me that a lot of construction workers have been inside, including himself. He had trained for building work once outside and worked in the sector many years before hearing about the Bounce Back project and applying for the chance to help others follow his footsteps to a productive and crime-free life. As one of London’s resettlement prisons, Brixton is known for its drive in getting people into work on release which, in turn, helps prevent re-offending. It is the prison that politicians visit when there is an announcement to be made and many have visited Bounce Back and others over the years. But it would be good to see this approach rolled out further. Like all organisations in this sector, the team behind Bounce Back would like to expand and believe that the more people know about their success they might get more funding to expand it. But when they point to their 85 per cent success rate in avoiding repeat offending – together with the £50,000 annual cost of keeping a prisoner inside – they may well have a strong case to put to the politicians who control the purse strings.